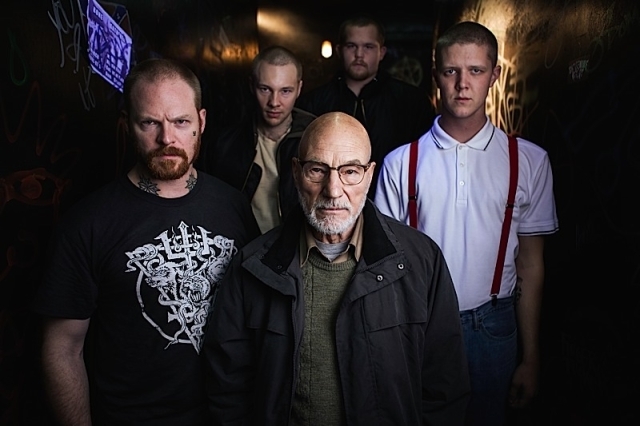 Screened at the Directors Fortnight at Cannes in 2015, Green Room is a fantastic, yet gruesome, horror film that will have you at the edge of your seat. The movie introduces us to The Ain’t Rights, a punk rock band made up by singer Tiger (Callum Turner), bassist Pat (Anton Yelchin), guitarist Sam (Alia Shawkat), and drummer Reece (Joe Cole). They are tirelessly touring, playing in some of the weirdest places. Not getting the cash they need to get at these venues, they sometimes have to resort to siphoning gas just to keep their Mystery Machine on route. They sit down to do an interview with journalist/booker Tad (David W. Thompson), who asks them the question: Who is your island band? Everyone comes up with a name, except Pat. After messing up the booking for a show, Tad gets The Ain’t Rights a matinee show at a roadhouse in deep-woods Oregon. The venue just so happens to be infested with white supremacists. Overseeing the proceedings is Darcy (Patrick Stewart), a merciless gang leader who will make you forget any warm thoughts of Jean-Luc Picard or Professor Xavier. The Ain’t Rights head to the green room after playing their set, where they stumble upon a murder. This is where the film turns into a stalk-and-slash as the punk rockers try desperately to escape. You can almost say this is three different movies. It starts out with a very good punk rock bio-pic. The music plays like a character, almost as much as the band members do. The soundtrack is laced with the who’s who of the punk world, as well as by in-film group The Ain’t Rights. When the murder happens, it becomes a hostage movie. For a considerable amount of time, Darcy is trying to get the band out of the green room. When they make it out of the room is when it turns into an extremely gory survival horror film. How it flows so seamlessly together is what makes this movie so good. 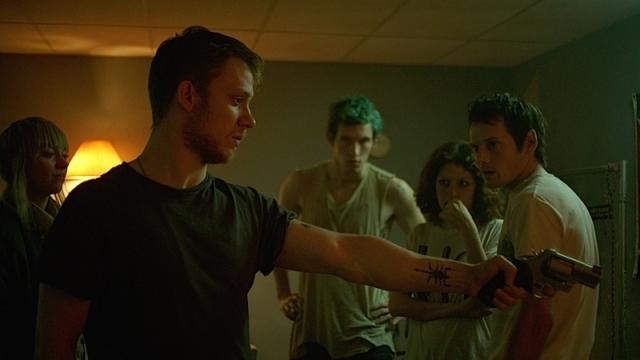 With its perfect pacing and unexpected story arc, Green Room takes a refreshing look at the thriller genre. The film breaks from the standard Hollywood formula to explore a fresh world where we are not subject to girls running away and falling down for no reason, fake jump scares, and people who have been killed magically coming back to life. This allows for some truly unexpected and enjoyable moments through the entirety of the movie. The character development in this film brings to life a new breed of thriller archetypes. There are no one-dimensional people who are there just to add to the body count. All of the characters have depth, even the bad guys. Gone are the faceless henchmen of traditional horror and thrillers. The neo-Nazi thugs had a sense of realism that give their actions meaning beyond just mindless killing. There is humanity to all the players, despite how despicable they might be. The protagonists are anything but heroes. They are flawed to the point that they could even be the antagonists on many other untold stories. You end up rooting for them because of the unfortunate situation they find themselves in, not because they are generally good or innocent people. Stewart gives a spectacular performance as the leader and owner of the bar. He is calculating, precise, and does not make the usual mistakes of movie villains: no exposition monologues or telling of dastardly plans, only doing what he believes needs to be done. The makeup effects seemed to be mostly practical effects and are stunning because of this. There are no cut aways or quick flashes of gore. The effects are in your face the majority of the time. Cuts and wounds show more than just spewing blood. We are shown flesh and meat that feels so real, the audience audibly gasps. It is not so gratuitous that it feels fake. People who like gore in horror movies will not be disappointed watching Green Room. Even the few places that seem to use CGI are masked well and do not feel out of place with everything we are shown. A theme through the movie until the very end is “what is your desert island band?” So…what IS your island band?